Saturday’s secondary feature at Gulfstream Park will be the $7 million Pegasus World Cup Turf Invitational, which has drawn a strong field of 10 (with perhaps 9 legitimate win contenders). The morning line favorite in the race is Yoshida at 5-2 odds for trainer Bill Mott with Jose Ortiz aboard. Even in a deep field with so many contenders, however, I still believe Yoshida will be a legit favorite who would be worth every penny of a bet at 5-2 odds — if you can get it. Yoshida has put together a very good career on turf with four wins and seven in-the-exacta finishes from 10 lifetime grass outings, including wins in the Hill Prince (G3) at Belmont and the Turf Classic (G1) at Churchill Downs. Yoshida has gotten better as his career has progressed, and he even made a highly successful crossover to the main track in the second-half of 2018 when he won the Woodward (G1) at Saratoga and then was fourth, beaten less than two lengths, last time out in the Breeders’ Cup Classic (G1). Back on the grass, Yoshida figures to be even better now and, while this field is very deep, it lacks a standout rival who jumps off the page as even being in the same league as this runner, who has never been better. Next Shares is an interesting contender in the Pegasus Turf, despite the fact that he’s 15-1 on the morning line and always seems to be ignored on the tote board in tough spots. If you like Yoshida and you need a horse to add some spice and value to your potential payoffs in the exotics, you could do a lot worse than looking in Next Share’s direction. Despite a disappointing effort in the Breeders’ Cup Mile (G1) two races ago, Next Shares seems like the classic kind of horse who “finally got good” after knocking around much of his career in good races, but without many wins to show for it. Next Shares blew away the field in the Shadwell Turf Mile (G1) for trainer Richard Baltas and rebounded last time with a come-from-behind win in the San Gabriel (G2) at 1 1/8 miles. The big question today is the 1 3/16-mile distance of this race, but, based on his last effort and his running style, 9 ½ furlongs should be within Next Shares’ reach. Of the other horses, Delta Prince attracts Frankie Dettori for trainer Jimmy Jerkens and likes the Gulfstream course, but he might be a bit overmatched here versus these. Japanese invader Aerolithe could be any kind, but seems to have a lot to prove here and Channel Maker looks like he would have been better suited to the 1 ½-mile McKnight earlier on the card — but who can blame them for taking a shot for $7 million? Bricks and Mortar won his return from a year layoff last time and goes out for trainer Chad Brown, but perhaps this kind of spot will be too much to ask too soon off the rest, especially as a likely underlay in the odds. Fahan Mura exits a nice Grade 3 win at Santa Anita, but will be stretched to the max — or perhaps beyond — at 1 3/16 miles today and probably is a notch under this kind of competition. Dubby Dubbie simply looks overmatched. 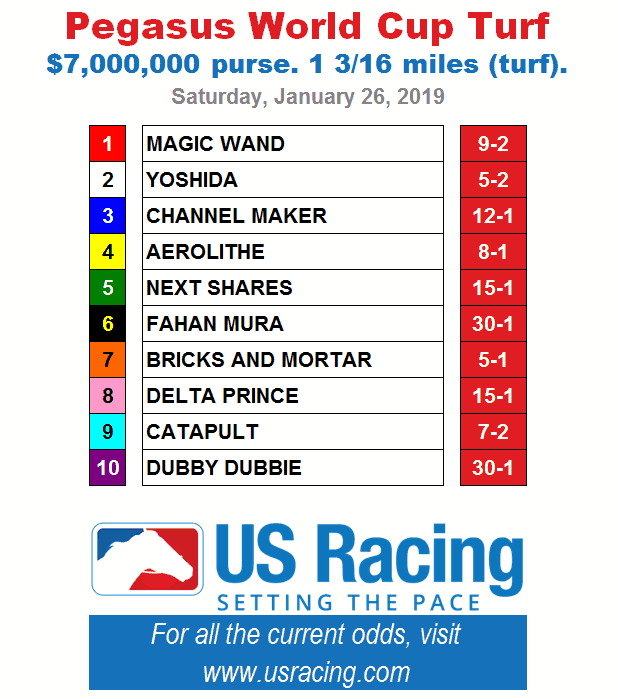 That leaves two more major contenders for the Pegasus Turf exotics and your multi-race wagers: Catapult and Magic Wand. Catapult has been in the exacta six straight times dating all the way back to mid-2017 — and he won the Del Mar Mile (G1) in 2018 before finishing second by a half-length in the Breeders’ Cup Mile last time out. It would be a mistake to overlook him for trainer John Sadler. It would also be a mistake to ignore Magic Wand, trained by Aidan O’Brien. Like Channel Maker, Magic Wand may be meant for longer distances, but Magic Wand looks scary here — at least for second, based on his solid fourth-place finish last time in the Breeders’ Cup Turf (G1) and his prior back-to-back runner-up finishes in a pair of premier Group 1 races at Longchamp.